For beginning Kansas anglers, there’s probably no better fish than bluegill. Bluegill are one of the most common, and easily caught, species of fish in Kansas. The saucer-shaped fish thrive in all sizes of farm ponds, community and state fishing lakes. Some clear streams, like in the Flint Hills, contain good populations of bluegill. While they can be caught on the hottest days of summer or through the ice in the dead of winter, mid-May through mid-June is prime time to catch bluegill in Kansas. That’s when the fish are spawning in the shallows, often in sheltered coves, and the male bluegill are guarding nests where they’ve fertilized eggs laid by a female fish. Their dished-out beds can often be seen in the shallows, especially by anglers wearing polarized sunglasses. Where you see one, you’ll probably see dozens arraigned in a honeycomb pattern. Spawn fishing for bluegill is great for young kids because the action can be fast and furious. A small hook, like a size 6 or 8, baited with a small piece of worm a foot or two below a nickel-sized bobber is all that’s needed. A tiny split-shot a few inches above the hook will help keep the bait down where the bluegill live. Since the fish are normally close to shore long casts aren’t needed. Most cartoon-character rods and reels will lob the bobber and bait far enough. If the bait doesn’t draw a bite in a few minutes reel it a foot or so. 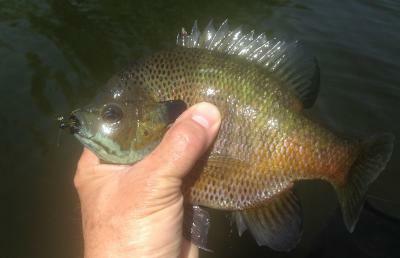 Bluegill are quick to defend their nests but won’t swim far to do it. A telescoping “cane” pole of nine or ten feet will work well, too. If you can’t find a spawning bed try fishing in shady areas near some kind of cover, like big rocks, where a tree has fallen into the water or near flooded vegetation. Saucer-shaped fish that fight really hard, bluegill are also popular with those who like fly-fishing. Small nymphs, like wooly buggers work well. In the summer it’s fun to cast a small top-water popper and watch as bluegill smash it on the surface. Bluegill can also be caught on small jigs and spinners, like a size 0 Mepps, and will put a serious bend in any ultra-light rod. Because their mouths are so small it helps to have something like a small set of needle-nosed pliers for removing hooks. Bluegill fillets have excellent flavor if you can catch them large enough to clean. Feel free to take enough home for a nice meal. Bluegill are prolific, and harvest often helps keep the fish from over-populating. For most Kansans there’s a good bluegill fishery nearby that’s open to the public. Western Kansas’ Scott State Lake and Meade State Lake both have good bluegill populations. A quick check of the 2018 fishing atlas will help you quickly find a spot nearby for bluegill fishing. Also be sure to check the department’s Community Fisheries Assistance Program, which leases lakes and ponds from cities or counties and opens them to the public. The Department’s Fishing Impoundments and Stream Habitats program leases some good private waters and opens them to public fishing.